Custom Email Domain can be used to use your domain branding for all emails that Crisp sends to your users. Also, your users will be able to reply to your emails directly to your domain. This guide explains you how Custom Email Domain works, and how to setup it. Custom Email Domain is available in Crisp Unlimited, which comes with a ton of other handy features for teams. If you cannot or don&apos;t want to use our Custom Email Domain feature, you can still customize your Basic Email Domain, which provides an email domain such as: company.on.crisp.email. Check your website settings advanced configuration (configuration steps are similar than those listed below). What Custom Email Domain do? The Custom Email Domain feature lets you use your own domain for emails sent by Crisp to your users, and vice-versa. Your users won&apos;t see the Crisp brand (eg. [..]@company.on.crisp.email) anymore in email addresses generated by Crisp for unread message notifications, chat transcripts, campaigns, and inbound emails. The email address you see in the screenshot above is generated from default Crisp mailing domain (ending in .on.crisp.email). You and your user can directly reply to this email, which will still be routed to Crisp servers (as with company.on.crisp.email). 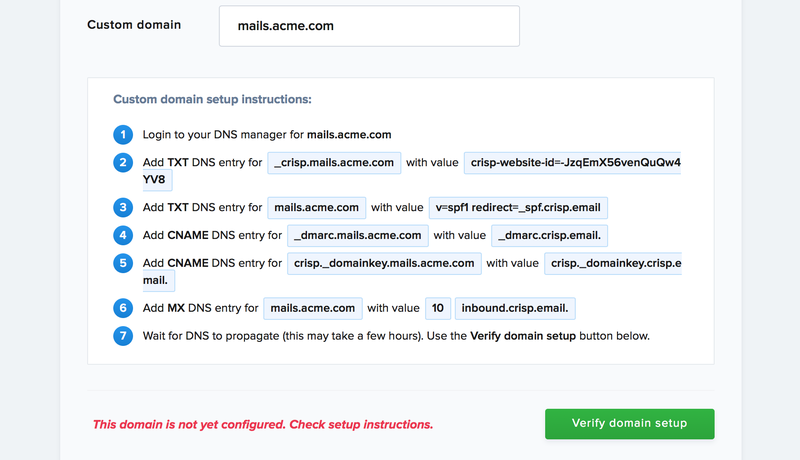 The Custom Email Domain feature only requires you to add a few DNS entries to your domain name manager. You won&apos;t need to install anything on your own server, or maintain anything over time. You can set it up and forget it. Make sure not to alter (remove or edit) the DNS records you&apos;ve configured, as this will cause issues with either receiving or sending emails via your Custom Email Domain. You get to manage your own mailing reputation from your own domain name. This means, less chance that your emails go to the spam folder. The Crisp brand won&apos;t be visible through email addresses. Your users see Crisp as fully integrated to your own branding (they have no way to see the Crisp brand in your communication). Which email domain should I use? The Custom Email Domain you choose to use for Crisp is important, as it will be seen by your users. Then, you will need to pick a sub-domain of acme.com to handle Crisp emails. You cannot use the base acme.com domain, as it is already in use for your internal emails (eg. running employee emails as john.doe@acme.com), if so, a Crisp custom email domain would conflict with your exisiting configuration. How to setup Custom Email Domain for my website? If you are using Cloudflare DNS, make sure the "Cloudflare proxy"/ mode is disabled for all DNS records you added. Ensure the cloud icon is grey (disabled) and not orange (enabled). This prevents Cloudflare from rewriting the DNS records. Go to your website settings on your Crisp Dashboard. Once the Custom Email Domain is active, you will see a green acknowledgement. Try sending emails to yourself using Crisp, eg. send yourself a chat transcript or create a campaign targeting yourself. Check that you receive the emails in your personal inbox. If you do not receive any email, check the following troubleshooting section. If the emails land in your spam folder, or are not received at all, feel free to contact us. We&apos;ll gladly assist you on any issue you have. How to use the same Custom Email Domain for multiple websites? The Custom Email Domain feature can be used across multiple websites, using the same domain. You just need to repeat the setup process for each desired website. You will only need to add one more DNS record per website, to prove the ownership of the Crisp website (namely, the TXT DNS record containing crisp-website-id). The other DNS records won&apos;t change across websites, so you can leave previous ones as-is. If you had to fix a mistake and clicked on Verify domain setup again, Crisp may not succeed verifying changes immediately, even if all the records are properly setup. This is due to the DNS cache system, which takes time to refresh and propagate. You may need to wait a few minutes to a few hours and re-enter your target email domain on Crisp, then verify again. In extreme cases, you may need to wait for a few days (if your DNS provider cache expiration values are very high). Outbound emails sent by Crisp are secured by SPF and DKIM. SPF specifies which SMTP server is allowed to send emails on your behalf, while DKIM cryptographically signs outgoing emails. DMARC then enforces a policy based on SPF and DKIM for email receivers, telling them to reject all invalid emails from your Custom Email Domain (ie. domains that fail both SPF and DKIM verifications). In case you and/or your users do not receive emails anymore, check that the SPF, DKIM and DMARC records that Crisp provides are correctly set, and not altered. Feel free to contact us if you have any question; we may have DMARC logs of what happened to your domain regarding DKIM and SPF. You may read this article dedicated to troubleshooting inbound email issues to Crisp Inbox. Inbound emails sent by your users to Crisp require that the MX record that we provide in the email setup is correctly set. If your users cannot email you anymore, or reply to emails sent by Crisp to them, double check that the DNS MX record is still set, and matches the one provided during the Custom Email Domain setup in Crisp. Also, check your website is still subscribed to Crisp Unlimited. Custom Email Domain requires a Crisp Unlimited subscription. Check your website is still subscribed to Crisp Unlimited, as it will be disabled if you downgraded your plan, or if you didn&apos;t renew it. Now, try the setup process again. Refer to the setup section for instructions. If you still cannot fix your issue, then contact us. We&apos;ll make sure your issue gets sorted out quickly.